News and articles are something that will never go out of style as it is an essential part of one’s social life. And long gone are the days of newspapers and magazine stands as digital technology continues to rise and dominate our media systems. Nowadays, there are more modern platforms where people can get their everyday information to become a highly involved individual of their community. For most media outlets, a stunning website is one of the essential things that they should consider if they want to tap on the general demographic, if not a target market. That is why we present to you some of the best and trendy website themes that you can use to spruce up your existing news and magazine websites or to build your new news portal and content magazines from below. 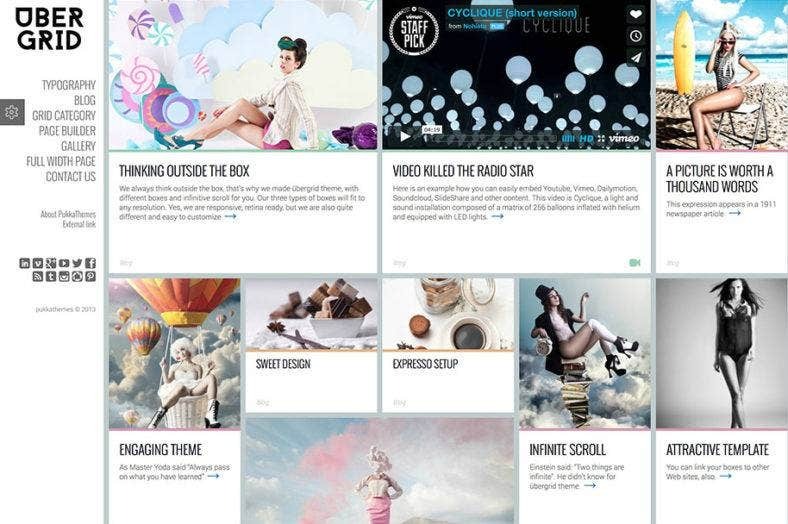 To start this list, here’s a sophisticated website theme that comes in a unique and creative magazine-style design. It is characterized by a clean color scheme of black, white, and red as well as a smart layout divided into columns which make it perfect for publishers of all kinds. 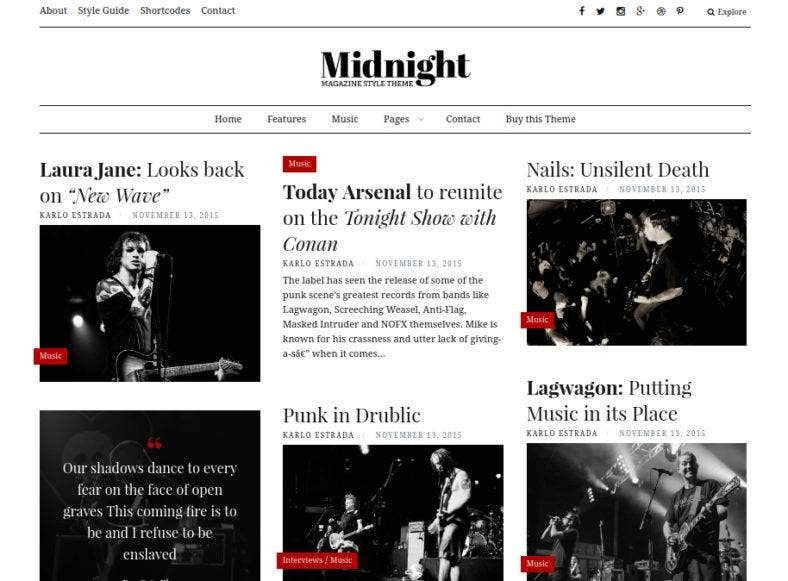 Midnight’s highlights include a responsive design with an infinite scroll design to keep its stunning visual aesthetic on all mobile devices of different screen sizes. It also features social media icons to link your social media accounts and boost your market reach. This template can be used to publish articles, reviews, blog posts, and more because of its extensive media support; thus, enabling you to create a striking and immersive content using different media platforms such as images, audios, quotes, videos, and even galleries of these. Next is this WordPress theme named Publisher, as it is mainly used for websites which publish written contents and other types. This theme has a simple and easy-to-the-eye aesthetics, yet includes a poweful design because of the various features it consists of. Amongst its many features is its optimization for both web and mobile users, which means the theme is responsive without compromising its usability. It also supports a number of post formats such as standard, image, or quote in a masonry grid layout. One of the neatest and standard-driven themes, Publisher is guaranteed to give your news and magazine websites a unique, cohesive, cascading display of texts, images, quotes, and more. Patch is a newspaper-inspired theme that will definitely give your website a modern and trendy touch, seamlessly generating a smart and adaptable layouts for your posts and matching them with the rest of your homepage to create a cohesive content. Other features that this theme possess includes a mobile-ready and responsive design, code-less and customizable web elements with live feedback. social icons to share your amazing content, good SEO practices that you can trust, and much more. With a dynamic and adaptable nature, Patch is the perfect theme to choose whether you’re writing about the latest news, interesting discoveries, useful tips, and how-tos, etc. You can also use to compile photographs, illustrations or artworks and make it into a portfolio website. 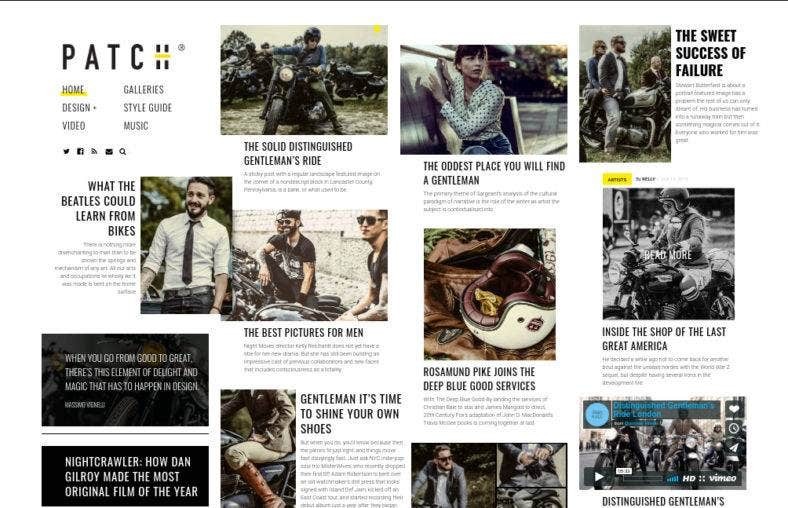 This WordPress magazine template is next on the list. 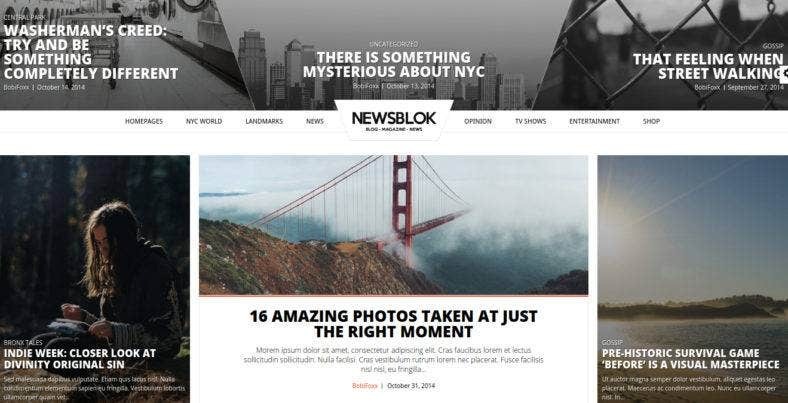 NewsBlok is one of the best and ultimate magazine and news theme perfect for all types of publishers. It is designed with a plethora of options which make this them easy to use and customize. The theme features a one button installation process after choosing from one of its multiple layout combinations. These combinations can be built from 20 custom widgets which can be displayed in 4 different available forms, creating a unique layout for your site. With a clean and minimalistic approach to its design, NewsBlok is lightweight and speed optimized. It is also fully responsive and WooCommerce ready, so it is easy to set up an eCommerce website if you decide to sell your content. Rexus is another magazine WordPress theme that comes with a colorful but elegant design. Its colored blocks layout provides your website stunning visual that will surely catch the eyes fo your potential viewers. It is modern and classy that works best with online magazine and news websites. This theme can also be used for text-based personal or community blogs. It also includes some key features such as a fully responsive layout, team page integration, advanced Theme Options, unlimited ad spaces and positions, beautiful custom pages, and much more. With all these powerful attributes, the theme is highly flexible and customizable to let you build a highly functional website. An image-ridden beautiful theme that suits well with blogs, magazines, news, and other content-based websites, Adamag is a WordPress template that that is loaded with features as it is loaded with content. Just like the other theme on this list, this template is fully responsive and mobile-friendlly, so, you don’t have to worry about how it looks in various devices. Adamag comes with advanced theme options, unlimited colors, 9 custom widgets, left and right sidebar choices, a homepage slider, and carousel. Moreover, the homepage is digitized so you can build your own homepage content layout. It also comes with ads widgets that you can put in a banner, sidebar, and header to promote your content. 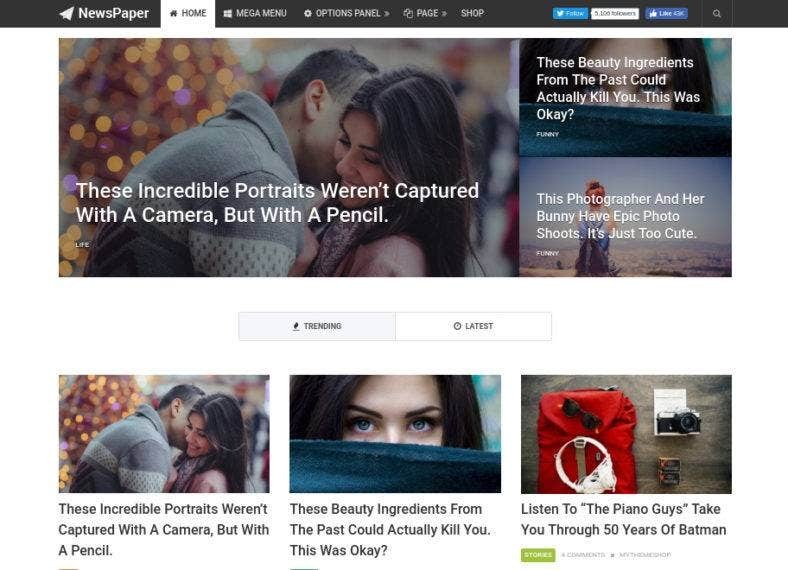 This powerful multi-purpose WordPress theme is made especially for content-heavy websites such as online newspapers, news, magazines, publishing, and review sites. NewScore includes exclusive features that allows you to create unique homepage layouts and various layouts for different post categories. Additionally, the template also includes well-placed ad spaces to promote your contents and services that will make you visitors look for more. It also allows you to post a variety of content forms like Youtube or Vimeo videos, a review or poll system, and others. Even with this collection of robust features, the theme is extremely editable and very easy to use, that even individuals with no coding experience can build a great website that provides a great user experience to its visitors. 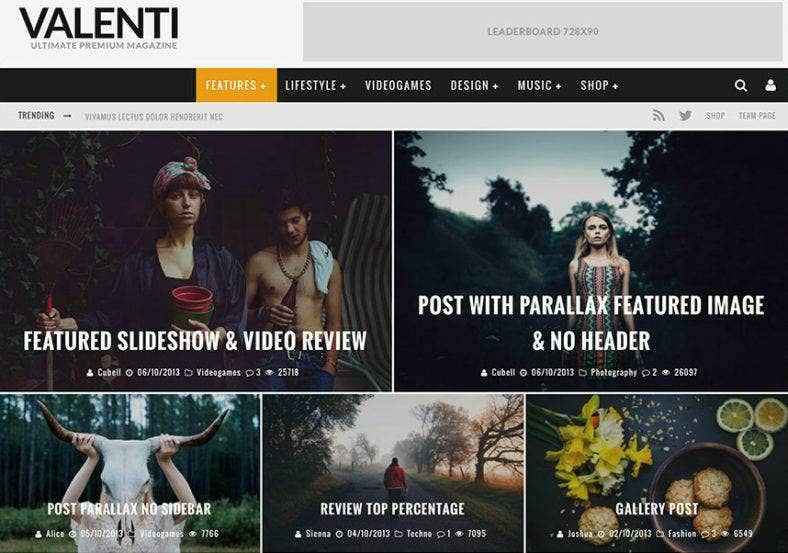 Valenti is an unlimate WordPress magazine theme that comes with a cutting-edge and feature-rich design. This template is made exclusively for highly creative content but can also be used for everday news, entertainment and other reading material. It features an exclusive drag-and-drop page builder that allows website owners and users to create a unique homepage and inner pages. Making modifications on your website according to your needs and preference is also made easy with this template. Furthermore, Valenti comes with a unique Megamenu system for beautiful drop down menus, a parallax effect that can be added into a featured image of a post, a powerful review system and widget, and a WooCommerce and BuddyPress integration for a complete website experience. A modish news, magazine and blog theme; this WordPress template is anything but amazing. Woohoo is a news website theme that definitely calls out your readers attention just like how its monicker would sound like. With a number of design layouts to choose from, you can build the perfect website for each and every topic that is of interest. Whether your content is about technology, fashion, health, or sports; there is an appropriate theme just for you. Woohoo comes with custom categories with different logo, color, and background choices. Along with the powerful Theme Options Panel, this theme will help you manage and customize your website’s look without difficulty and less effort. With a beautiful color palette and unique web design, Ubergrid is the best website for creative lady writers, publishers, content makers, and even entrepreneurs. Filled with feminine elements, this responsive WordPress theme suits well with news and magazine websites with topics about fashion, lifestyle, health or art. The theme also comes with tons of powerful features that will help you create the website that you want. First of all, it has a grid-based, responsive and retina ready design that ensures a high-quality presentation on any device of different screen sizes. Other features include a post format support, a Theme Manager, Page builder, Front Page Manager, Infinite Scroll, etc..
Next is this minimal WordPress theme for fashion blogs and online magazine websites. 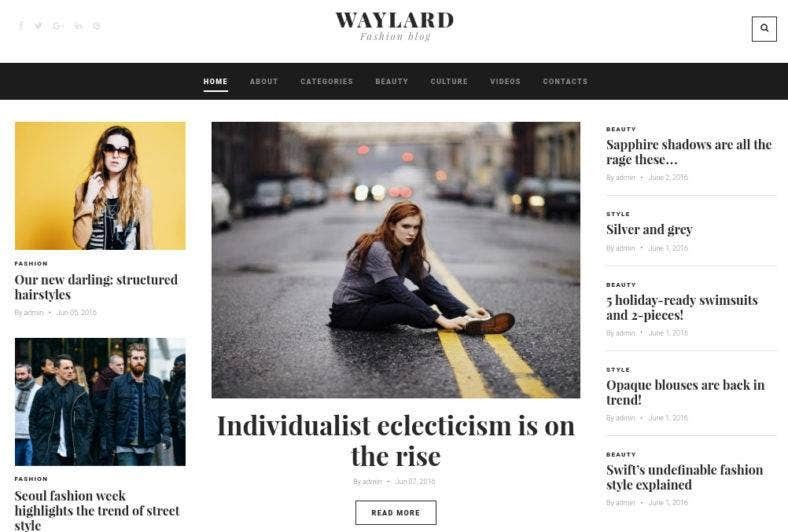 Waylard is a website theme that comes with simplae and classic layout yet, does not comes short in features and options for you to create a professional-looking website. Its features include a huge set of premium and custom widgets that will help you build versatile and rich in functionality layouts. It is also integrated with the WordPress Live Customizer that allows you to edit and change your website’s look in real time. Other useful attributes that you can add to your website are the post carousel, simple slider, image grid, and category titles to name a few. This template is also SEO friendly that many big and major search engines will love. BitNews is another minimalist WordPress theme that comes with a clean and clutter-free layout that is ideal for any modern blog magazine and news portal websites. This theme is loaded with premium features that will help carry out your content-heavy web projects. The theme runs on a fully responsive framework that will adjust smoothly to any screen size. It is built with the latest web design trends in mind, that is why it has a card-based content positioning that catches the audience’s eyes and guides them to your content. Pre-loaded with a set of Google web fonts over a smart use of white spaces, it enables you to create a content hierarchy that is easy to comprehend. It is social media ready and SEO friendly, so you can also use this template for your business’ digital marketing strategies. For reviews of different niches like technology, gadgets, music or movies, GadNews is one of the website templates that you should consider. It is easy and intuitive and consists of a slew of features, shortcodes, and customization options. Built with the Bootstrap framework, it features the very efficient WordPress Live Customizer for easy customization. Along with a valid and well-documented code, this theme allows you to create the website that you want even without any knowledge of coding. With a penchant for large titles, readable content, ample clean space, and contrast of the light layout with the dark header and footer, GadNews ensures an optimal visual experience for readers who are especially keen on every technological aspect of things. 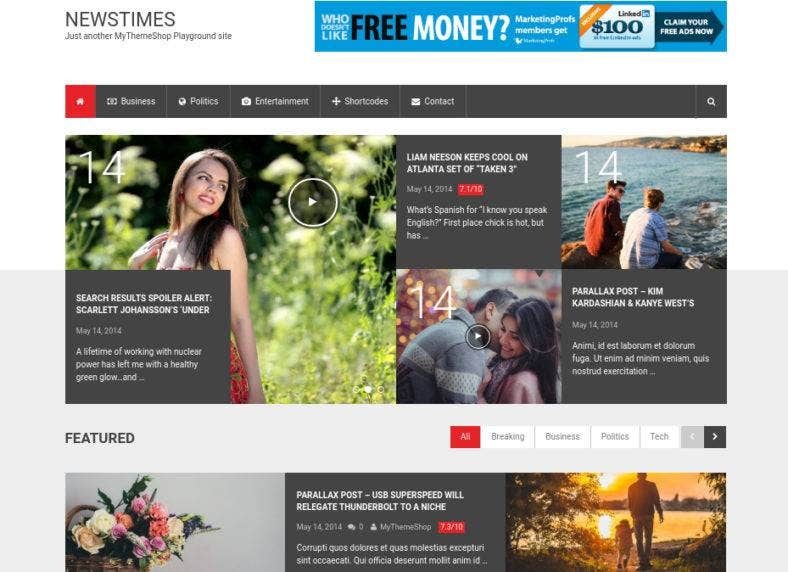 NewsTimes, on the other hand, is a premium WordPress theme for news and blogs that deviates from the classic web design. It comes in a block-based layout in an ultra responsive framework that works perfectly with all device types and browser sizes. Built with the latest HTML5/CSS3 techniques, the theme is remarkably customizable with unlimited colors to choose from, powerful Options Panel, unlimited sidebars to use, and a homepage layout manager among others. For its mobile version, it features an off-canvas menu to help conserve space and preserve its already amazing user experience. Due to its optimized code, the theme is also fast and lightweight that will help boost your website’s overall performance. 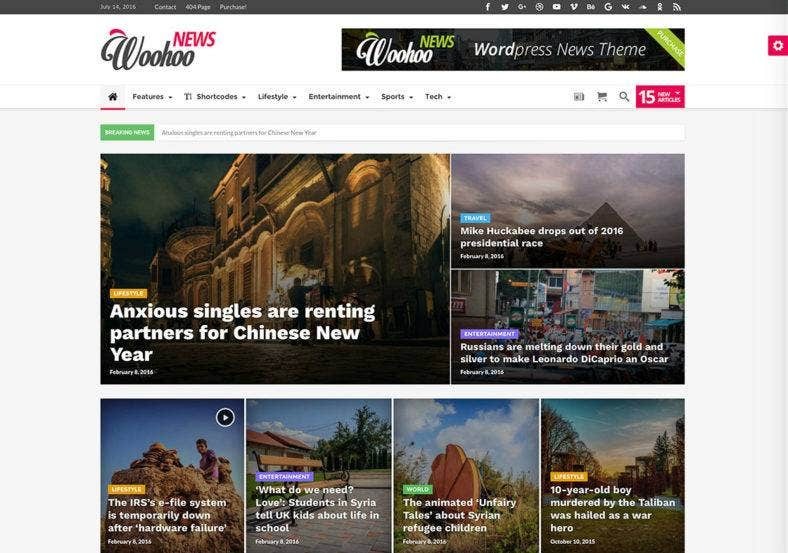 A modern and classy website theme for blogs, news, and magazines; Interactive is WordPress theme that is eye-catching as well as highly professional. It features a three column layout, amazing typography, and tons of customization options that will help every webmaster and content curator engage their readers. Amongst the other features that this theme includes are the powerful options Panel, One Click Installation, an off-canvas mobile menu, a Breaking News ticker, and a super fast load time. All these attributes contribute greatly to a highly functional and usable website that makes your interaction with your readers a great experience. Newspaper is a content-oriented magazine template that provides a clean and clutter-free platform that wil surely highly your content more than anything else. It has aclassic website layout but aso comes with trendy and latest features. It’s a beautiful and elegant WordPress theme that is perfect to use for any types of topics. 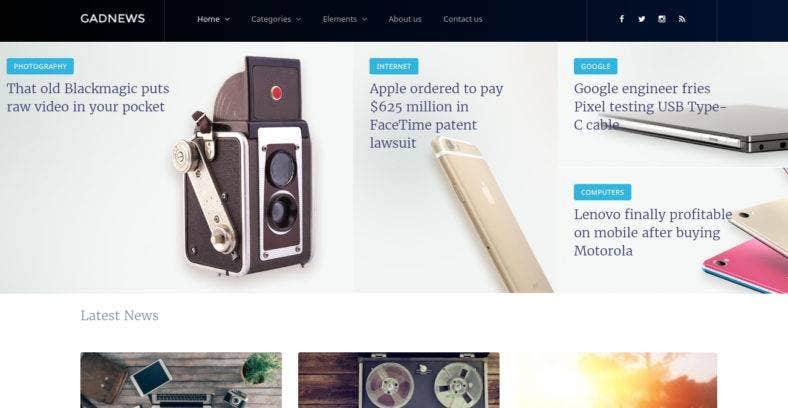 Built particularly for content-rich websites, this theme doesn not fall short on its media-rich features that give you the opportunity to post various content formats. It is highlighted with multiple post layouts that you can choose from, which includes tons of customization options, advanced features, and popular WordPress plugins support. 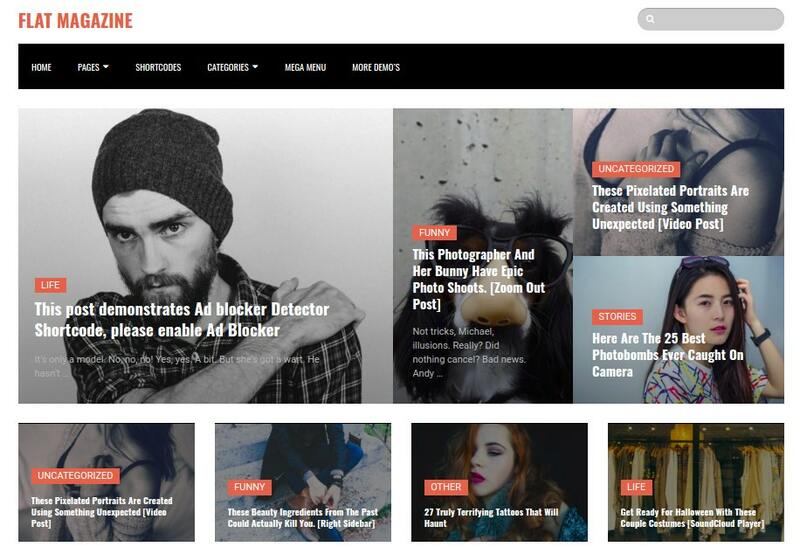 Here is Magazine Pro, a responsive WordPress theme that is created to become a platform for content-heavy websites such as news, magazines, reviews, blogs, and others. It is packed with a bunch of essential features that caters to all kinds kinds of news and magazine website requirements. The theme presents various homepage layouts that you can choose; like masonry, blocks, default, and classic. Another a different sidebar layout possibilities which make it easy for users to select whether they want 2 sidebars or single or no sidebar. It also gives you the option to select within grid layout or list view for categories and archives. Being fully responsive, it is also mobile friendly and retina ready to ensure quality visualization across devices and browser, as well as to keep its user experience as smooth as it is on the web. 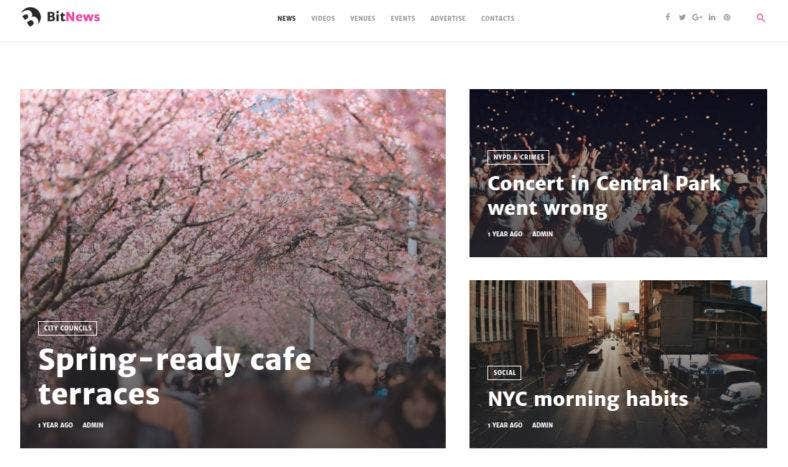 On the other hand; VMag is a premium magazine, news, and editorial WordPress template that is easy to use as it is enriched with powerful features and functionalities. Its the best premium theme ideal for online newspaper, magazines, journals, professional blogs and other review publishing sites. The theme allows you to configure most of its element with a live preview, along with its loads of customization possibilities and multiple options. It includes mega menu, multiple header layouts, news ticker, multiple category posts widget, unlimited color options and much more. Using this theme will definitely enhance the functionality of your website as per your requirement as it is certainly the best and complete solution for any type of content focused websites. 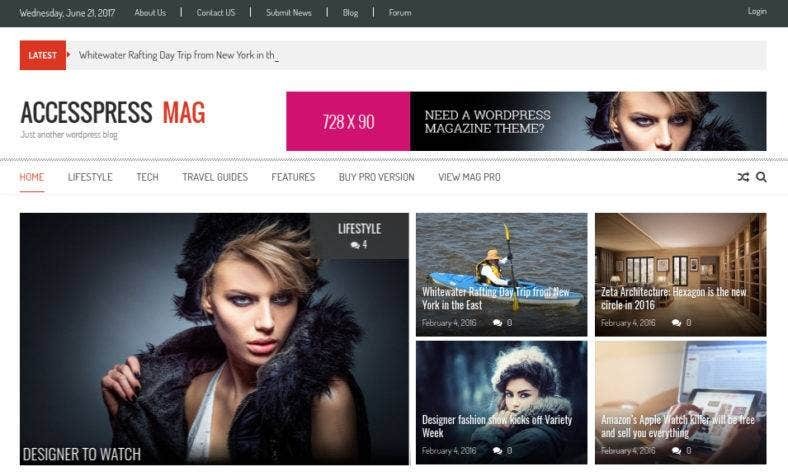 AccessPress Mag is an amazingly flexible and modern free news and magazine theme for WordPress. Fully responsive and SEO optimized, this theme suits well with every online magazines, news websites, editorial related projects, blogs or personal websites. It is a cutting-edge & ideal solution for website owners as it lays a strong online presence for different kinds of fascinating and interesting content. Using AccessPress Mag on your websites does not mean you are limited to basic features, as it is also packed with some premium attributes. Included in its roster of features are its 2 post layouts to choose from, an author block to boost your post’s integrity, large featured images for page and post, and social media integration for a wider social reach. 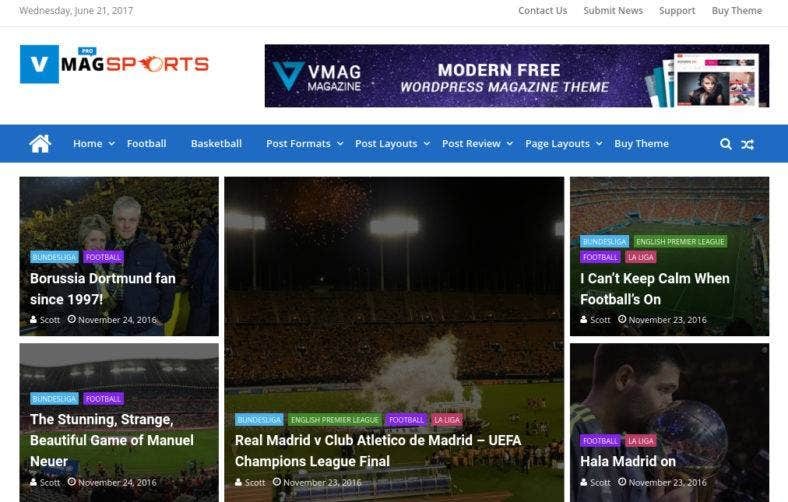 Last but not the least, is SportsMag; another free WordPress template amazingly flexible and extremely ustomizable despite its costless availablity. 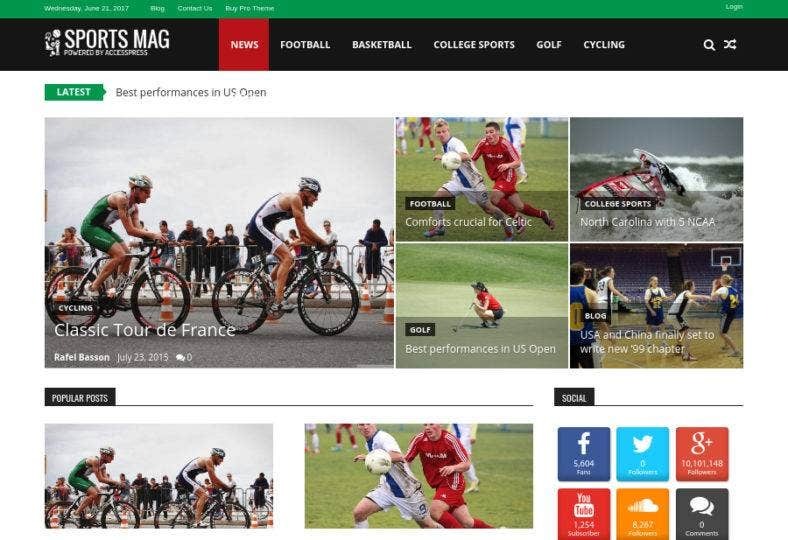 A perfect theme for sports news and other types of media coverage, it features multiple layouts, a fully modern magazine homepage design, a stunningly beautiful article page with image, image caption, video, title, sub titles. To improve your market reach; the theme is integrated with a social counter and social icons to link your social network accounts, a beautiful commenting system, and an ads section where you can put your banner ads and marketing images. 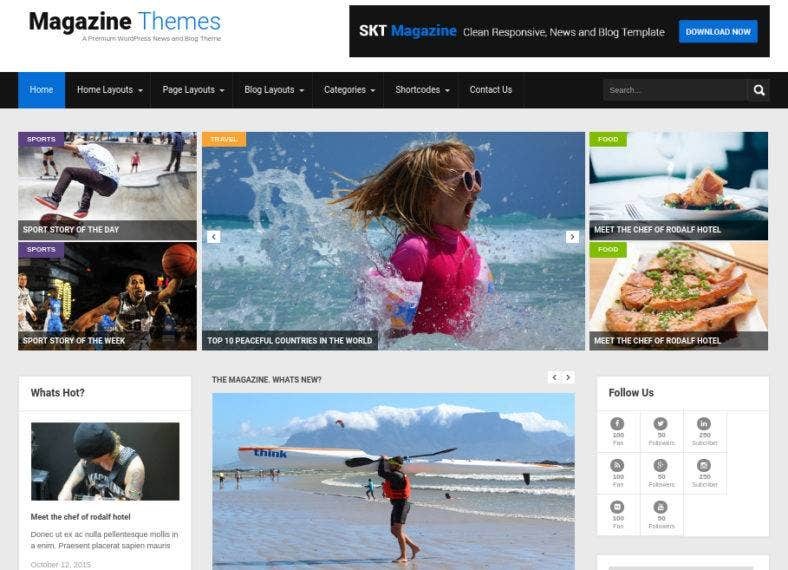 It is a responsive magazine WordPress theme which has been tested with all devices and across different platforms.